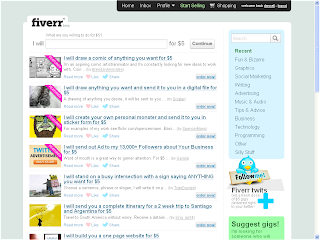 Fiverr is a new open marketplace for buyers and sellers of services. Sellers offer a particular service that they will carry out for $5. Examples include anything from proof-reading a CV, to creating a simple website, to creating an 'Avatar' style pic from a photo, to help in filling out immigration forms, to burning an effigy of your enemy. It's effectively like Etsy, but for services. The idea that everything costs $5 is inspired, because it's a good way to get a taster of whether someone is genuine and does a good job. Once you're in touch with them after the first job, I'm sure more complex projects can be discussed. It's also a bit like Mechanical Turk, Amazon's crowdsourcing platform, where you can recruit people to tasks like tagging huge numbers of photos, but more fun and interesting. 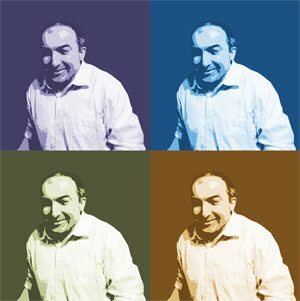 Update - and here's an 'Andy Warhol' version of a picture of me, made by Shirley for $5.